After taking a few months off for Secret Wars, the ongoing Spider-Gwen series returns next week with The Radioactive Spider-Gwen #1, receiving a considerable boost in profile by debuting as one of the launch titles of the “All-New, All-Different” Marvel publishing initiative. The book’s creative team is neither new nor different, but writer Jason Latour, artist Robbi Rodriguez, colorist Rico Renzi, and letterer Clayton Cowles only got through five issues of Gwen’s ongoing adventures before the world ended for Marvel’s summer event, barely scratching the surface of the alternate universe they were building. Thankfully, (spoilers for a series that still has three more issues) Gwen’s Earth is still around after Secret Wars, and this preview of Spider-Gwen’s return highlights the fun sense of humor that has made her world a refreshing alternative to the main Marvel universe. 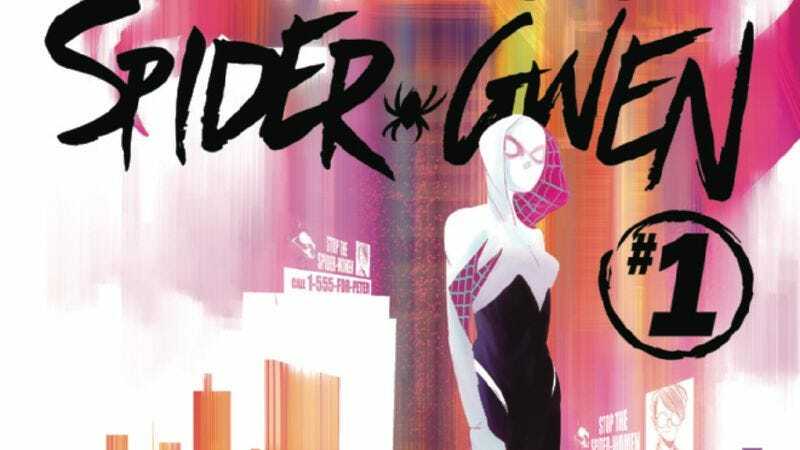 Superhero stories shouldn’t be afraid of comedy, and Latour’s writing on Spider-Gwen consistently balances the drama of Gwen’s double life with humor. Sure, she’s being hunted by the police and is still grieving the death of her friend Peter Parker, but her archnemesis is the Bodega Bandit, who robs convenience stores with the assistance of his pug sidekick Bandito. Rodriguez’s expressive, animation-inspired art accentuates those comedic elements, and Renzi’s vibrant coloring keeps the tone light with bright neons and pastels. The book feels a lot fresher than a lot of superhero comics, and little details like Cowles’ borderless word balloons give The Radioactive Spider-Gwen a modern edge that has contributed to the character’s breakout popularity. Spider-Gwen’s costume is a big part of that progressive quality, and this first issue’s cosplay variant cover shows why the costume has such enthusiastic fans. Rodriguez’s design translates easily from the page to real fabric, and Katherine Zan’s cosplay interpretation is very sleek but also has a homemade quality that perfectly fits the character. Marvel wouldn’t have to make any changes if they decided to bring Spider-Gwen into live-action, and with a new Spider-Man film on the horizon, a superpowered Gwen Stacy could be just the thing to make a new Spidey franchise stand out from its two predecessors.